Where can I see my Q-rator posts? Now that you're done scheduling, it's time to go see where those posts are. These are posts that haven't gone out yet. You can view the scheduled posts under the respective Queues. Learn more about Queues. 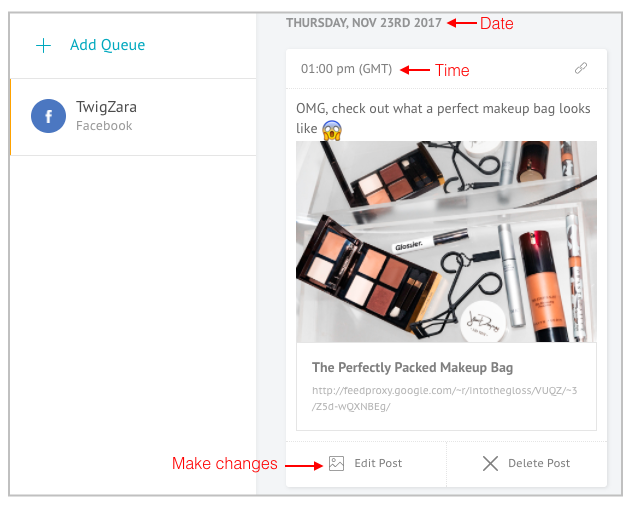 To make changes to any of the scheduled posts, click on Edit Post. Learn more about editing a post. 1. Go to the Calendar tab from the left column in your Socioh dashboard. 2. 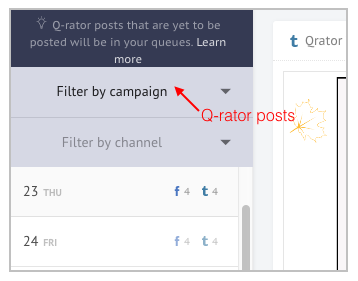 Choose Q-rator posts from Filter by Campaign. If you see error messages for any of the posts or have questions, please let us know. To send us your questions, click on the orange and white text box in the bottom-right corner of your dashboard. How can I edit my Q-rator posts?